Things were getting worse. The Teacher hadn't come and the sickness was progressing. Had the message not reached Him? Lazarus lay dying. And they waited for Jesus to come. Jesus loved Martha and Mary. He loved Lazarus. So when they sent word to Him that Lazarus was sick . . . Jesus waited. Now a certain man was ill, Lazarus of Bethany, the village of Mary and her sister Martha. It was Mary who anointed the Lord with ointment and wiped his feet with her hair, whose brother Lazarus was ill. So the sisters sent to him, saying, "Lord, he whom you love is ill." But when Jesus heard it he said, "This illness does not lead to death. It is for the glory of God, so that the Son of God may be glorified through it." Now Jesus loved Martha and her sister and Lazarus. So, when he heard that Lazarus was ill, he stayed two days longer in the place where he was (John 11:1–6). When the message reached Jesus, He waited. He stayed two days longer. He didn't rush. He didn't run. He didn't even heal from a distance like He did with the centurion's servant. The word "disappointed" is never penned in this text, but it is written all over the story. I'm sure Mary and Martha were disappointed. They knew Jesus could heal their brother. They knew it would be no problem for Him. They told Him as much, as soon as He showed up (four days late according to them). I can just see Martha's arms crossed and her stern glare as she rebukes Jesus: "Lord, if you had been here, my brother would not have died" (John 11:21). She lays the blame for Lazarus' death at His feet. She poured out her heart with an urgent request, and Jesus didn't come through. He let her down. I have unanswered prayers. I have urgent requests that haven't been attended to. I have loved ones who are dying without hope of eternal life. Jesus was right where He was supposed to be. He loved them, so He waited. His heart was for their best, so He waited. His vision was beyond the expected, so He waited. His obedience was to the Father's plan, so He waited. Jesus was in no hurry to move because in the waiting there is always great purpose. John provides the details, so there is no mistaking who "this Lazarus" is. He is Lazarus of Bethany, "the village of Mary and her sister Martha." But to add to that emphasis, John includes this detail: "It was Mary who anointed the Lord with ointment and wiped his feet with her hair, whose brother Lazarus was ill."
Note that detail. The Holy Spirit through John is signifying to us that He knows which Mary it is; we should pay attention to the fact that this is no "common Mary." This is the Mary who prepared Jesus for His burial. The anointing would take place later, after this incident, but John wants the reader to realize this was the Mary who was deeply devoted to the Savior, the same Mary who sat at His feet to soak up every word from His lips. The sisters sent the message, not with the bare facts that "Lazarus is ill" but framed the message with touching urgency as they relayed "he whom you love is ill."
Jesus waited because this was about more than sweet Mary. This was about more than faithful Martha. This was about even more than the beloved Lazarus. Jesus waited for the glory of God. Jesus waited so that the greater would occur. If Jesus had come when Martha called for Him, there would've been no stretching of their faith. There would've been no crowd of mourners to witness the Life-Giver in action. There would've been no resurrection to astound the Jewish community and stir up a death sentence. If Jesus had responded when the sisters first called, the greater would've been sacrificed for what they thought was best. But because He loved them, because He desired God's glory, Jesus waited. Dear one, what are you asking Him for today? Have you been crying out for a very long time without any sign of response? Don't think He does not see, does not know, does not care. Jesus knows and cares; He will not turn a blind eye to those who cry out to Him for mercy . . . but He may wait. 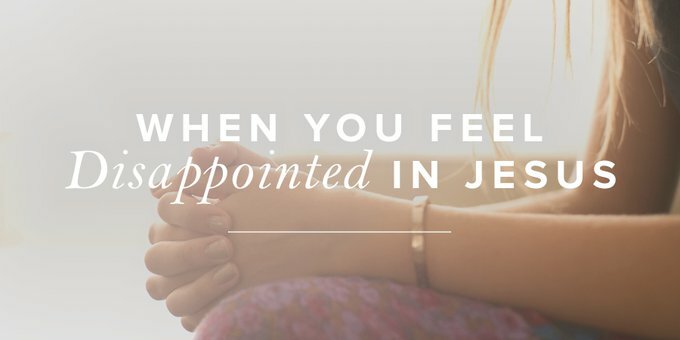 Because He loves you, Jesus may wait. For God's glory, Jesus may wait. For God's greater work, Jesus may wait. While you wait, turn your heart in full devotion to Him knowing that all that He does is good: "The LORD is good, a stronghold in the day of trouble, he knows those who take refuge in him" (Nah. 1:7). If you need more comfort from God’s Word for your disappointment, we have a new study book that could help. Head over to ReviveOurHearts.com/Elizabeth to learn more.